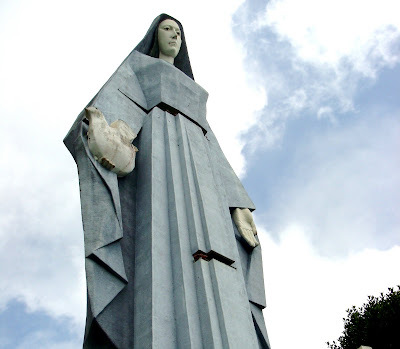 The artist Manuel de la Fuente, who created a famous monument to the Virgen de La Paz in Trujillo, has died in the city of Merida. He was 78 years old. Born in Cadiz, Spain, De la Fuente studied sculpture, drawing and the history of art in Seville, where he first found work as an art teacher. In 1958 he moved to Venezuela and in 1959 he arrived in Merida, where he taught art and architecture for forty years at the University of the Andes (ULA). La Virgen de la Paz is a truly monumental sculpture. Set atop a hilltop at 1,700 metres above sea level, the painted concrete structure showing the Virgin Mary with a dove of peace in her right hand is nearly 47 metres high and weighs 1,200 tonnes. Visitors can climb up the centre of the sculpture to reach the topmost of the five viewpoints which give views over Trujillo to parts of Zulia and Merida states. 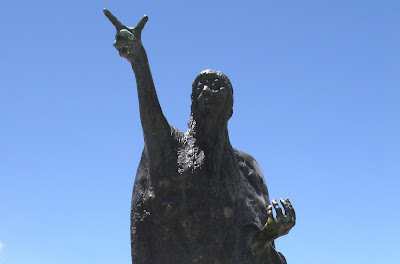 But De la Fuente's best-loved sculpture must be the large bronze of La Loca Luz Caraballo, located at 3,500 m above sea level in the park of the same name in the mountain village of Apartaderos, just outside Merida. The woman with the tortured look and her twisted hand pointing off into the distance is Luz Caraballo, a mother who went mad after losing five of her children in different ways. Legend has it that two of her boys joined the army of Independence hero Simon Bolivar as he passed through the Andes. Luz Caraballo became an iconic figure after her personal tragedy was immortalized in a poem by Andres Eloy Blanco. De la Fuente completed the sculpture in 1967. He was also a very kind man. When we first moved to Merida we lived in a rented house next door to his workshop. We had no electricity and he allowed us to run a line from his shop with no charge until we could finally get service.